8:30, meet guide & driver to transfer to Ninh Binh. A 100 km drive through the countryside to Vietnam’s first capital, Hoa Lu. After that we transfer to Tam Coc, where you can take a sampan on river through the rice paddies to the grottoes of the sacred Tam Coc Caves. Enormous limestone karsts jut out from the green rice fields giving rise to this place’s other name, “Halong Bay on land”. Lunch at a local restaurant is included. In the afternoon, bicycling around Ninh Binh to visit some handicraft villages if you want or just simply stroll on the countryside roads and chat up with the locals. After breakfast, start our day transferring to Cuc Phuong National Park (120km) across fascinating countryside of the Red River delta. Cuc Phuong national park is home to 2,000 species of flora, 1,800 species of insect, 320 species of bird, 70 species of mammal, etc. On arrival, check in hotel and have lunch in the park headquarters. In the afternoon, you will visit the Park museum, the botanical garden with a collection of 252 species of rare plants and the endangered Primate Rescue Center. 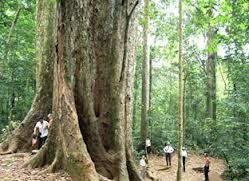 Escorted by a park guide, depart for a full-day trek to see giant trees of 50m high. First, transfer by car to the park center (20km), stop by a prehistoric cave and the Vu Huong tree (Cinamomum balansae) en route. Take a trek (6km) to the 1,000-year-old tree (Terminalia myriocarapa) on a scenic trail. Have picnic lunch at the park center. In the afternoon, continue to trek (8km) to the Dang tree (Tetrameles nudiflora) on a steep trail through a dense jungle. Transfer back to Hanoi in the late afternoon. What to bring: Passport, Sun glasses and hat, toiletries, sunblock, insect repellent, flashlights, good hiking shoes, personal firs aid kid and medicines, small VND notes for buying drinks, Sleeping bag (highly recommended).